I told you last year how much I love Valentine’s Day, and it’s still true. This year I’m having a Galentine’s Day Party (for some gals, on February 13th). I’m making a couple different treats and thought I would share this one with you all. It’s simple, and doesn’t require you to cook anything- assembly only! 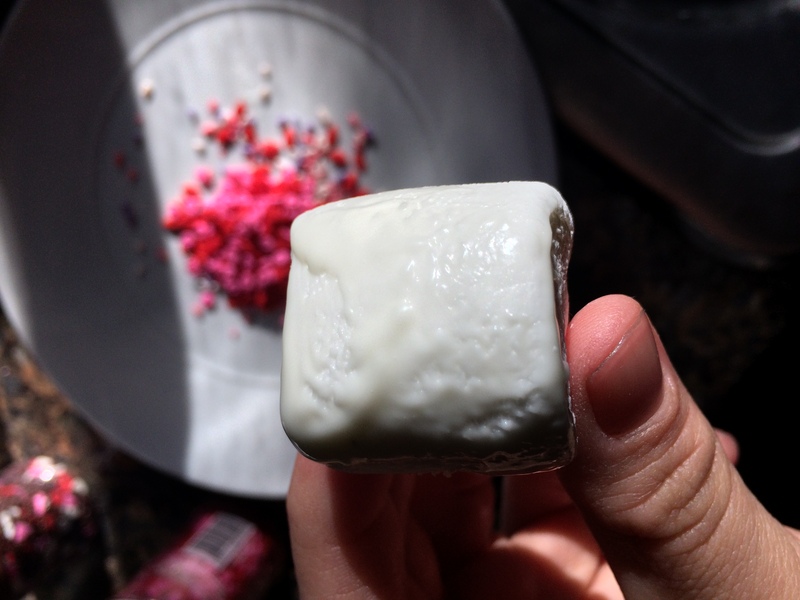 I usually use brownie pieces for these, but I wanted at least one treat that wasn’t saturated with milky, fudgy goodness, so for this rendition I used pound cake cubes. I did a trial run for my family. 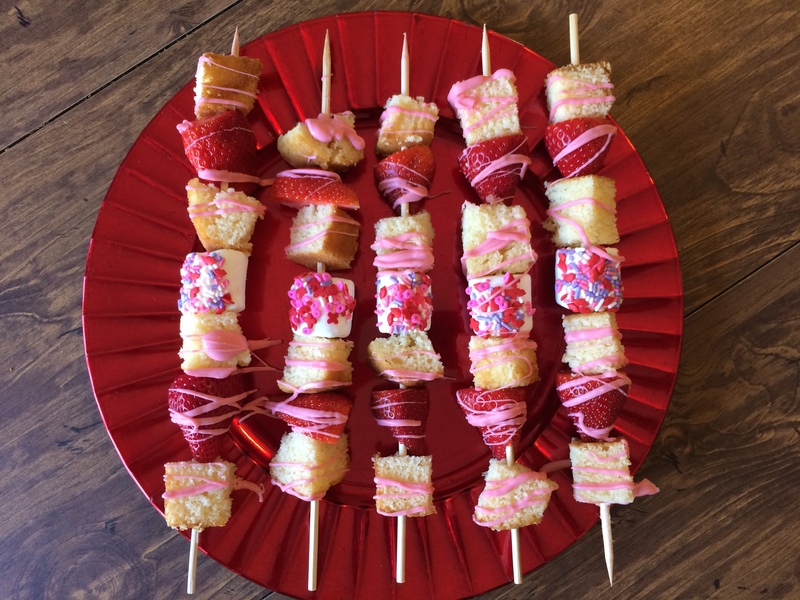 My kids LOVE anything on a stick and dessert skewers are some of their favorites. They feel fancy and whimsical, while being portion controlled and simple- can I get an AMEN? 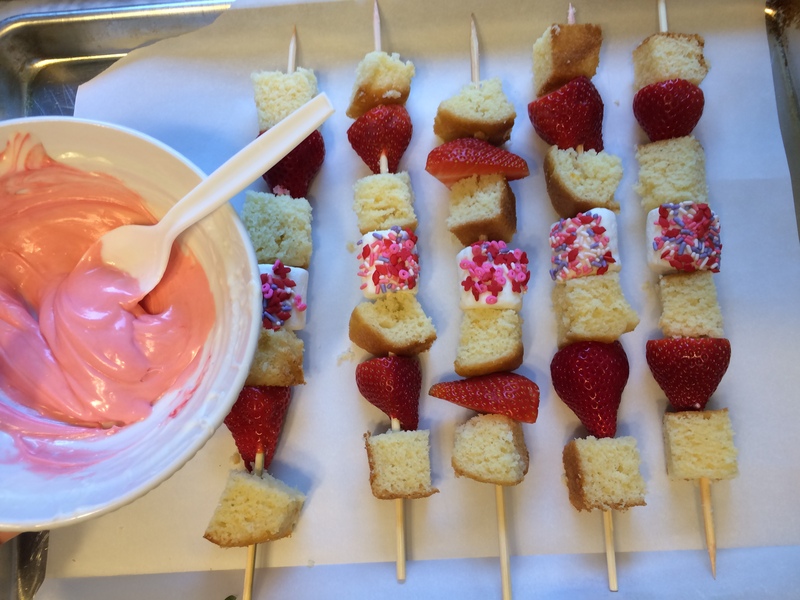 The combinations for dessert skewers are pretty endless, so if this combination isn’t doing it for you, then go crazy with your favorites on a stick. 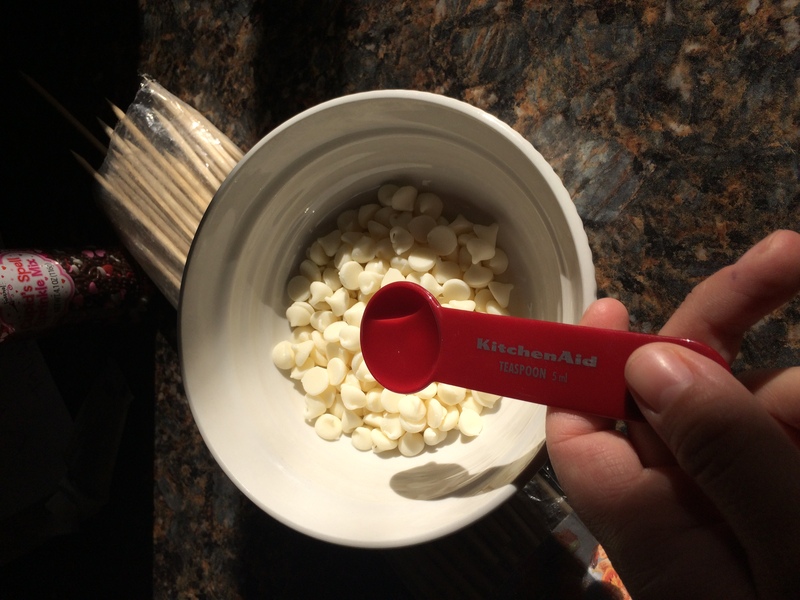 I started with ½ cup white chocolate chips and a teaspoon of vegetable oil. Warm them in the microwave on 20 second increments, stirring after each 20 seconds. You want them nice and melty and smooth. Now prepare your big marshmallows. 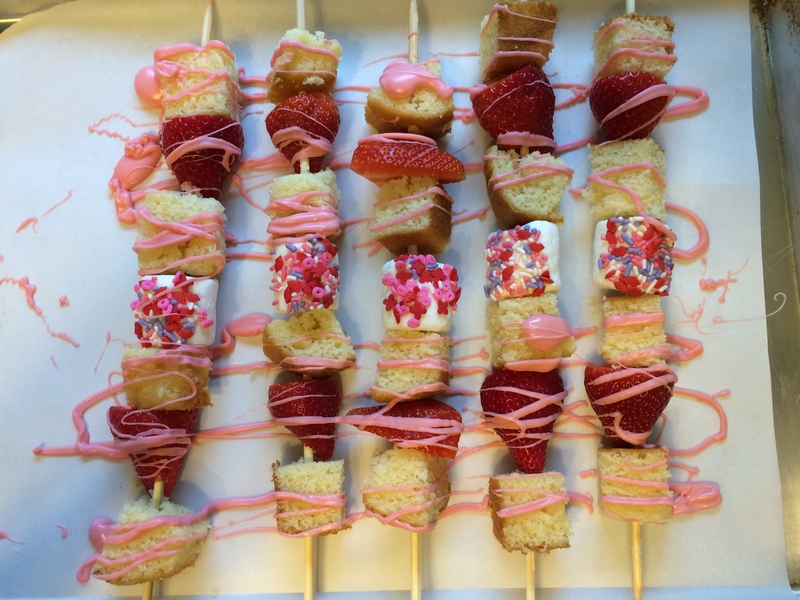 I’m using these as the center of my skewer so I fancied them up with some sprinkles. 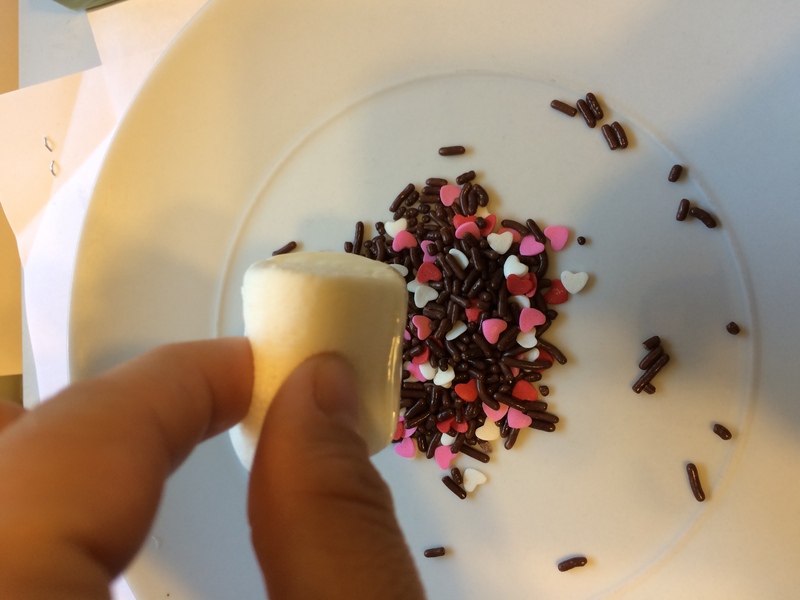 Dip one side of the marshmallow in your melted chocolate. Scrape off the excess chocolate on the side of the bowl. You really don’t need too much, just enough for your sprinkles to stick. Too much chocolate, and your sprinkles will ooze off in globs. 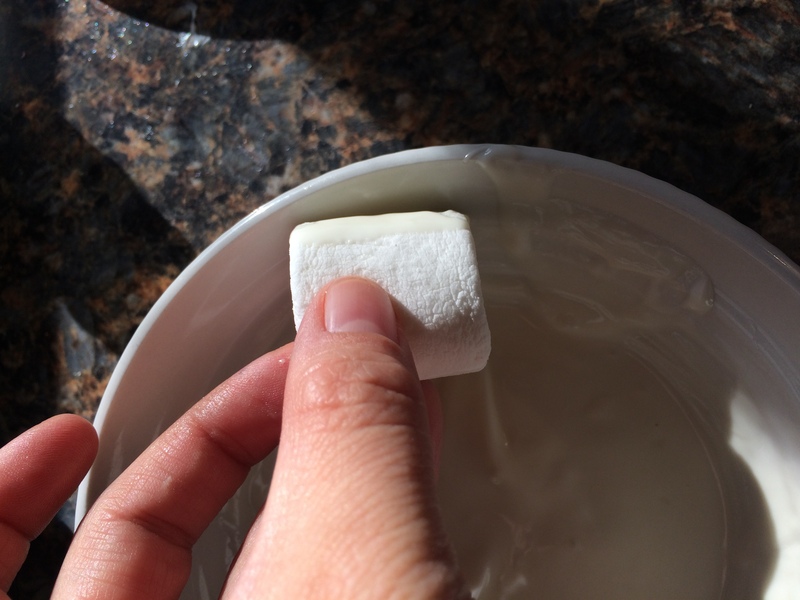 Dip your marshmallow in a fun sprinkle mix and set on wax paper to dry. Then cube up your pound cake. I bought mine at my local grocery store in the bakery section. They are in loaves. 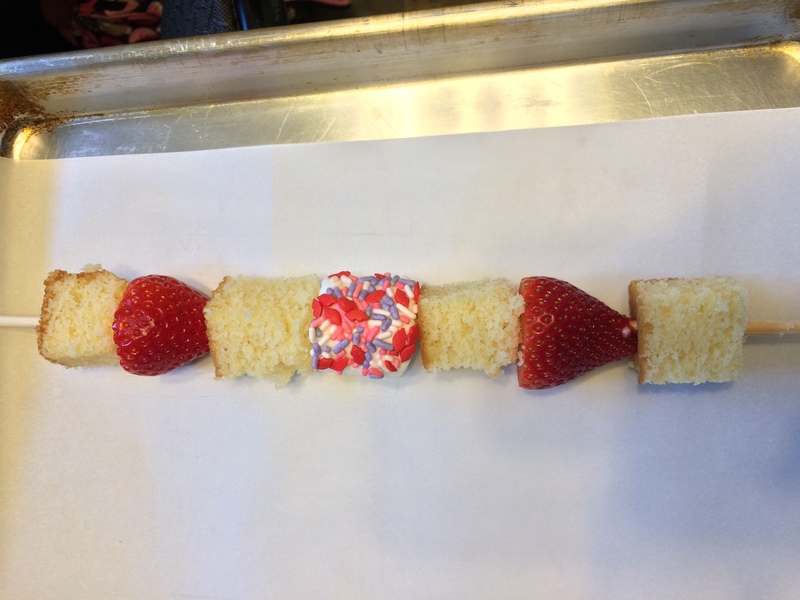 I’ve found I can do about 8 skewers with one pound cake. You’ll want sturdy sized cubes for threading on your skewer, so get chunky. Wash your strawberries. Cut off the stems; if those beauties are really big you can cut them in half. Pat them dry. De-splinter your skewers of any visible strands. I roll them all together like chopsticks- seems to do the trick. Don’t stress too much about this step, I’ve never had splinter problems in all the times I’ve cooked with skewers. Lay your finished skewers on a baking sheet lined with wax or parchment paper. I then put a few drops of food coloring in my remaining chocolate (reheat for 20 seconds if you need) to make pink chocolate. You guessed it. We are going to drizzle these babies. 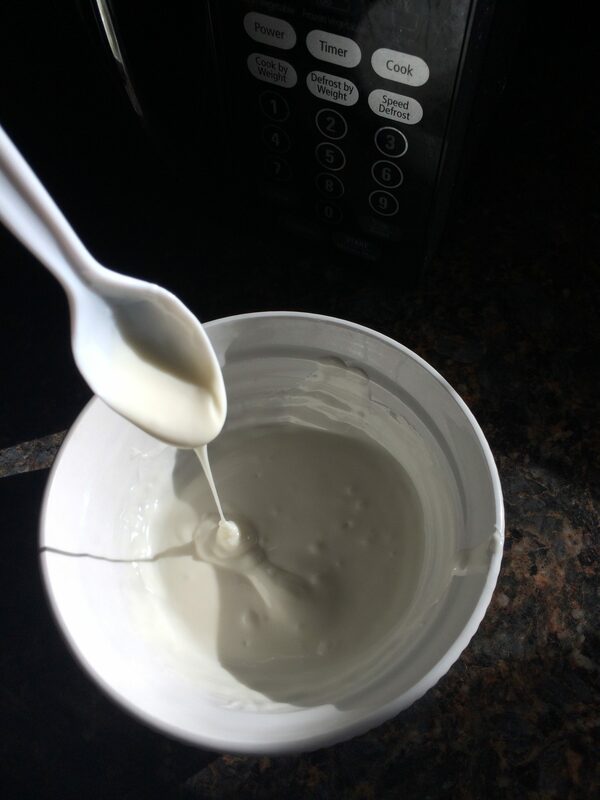 I’ve found big spoonfuls with quick constant pouring produces the best result. Drizzle in long horizontal lines along your skewers. Be courageous in your drizzling! I tried to miss the marshmallows as they are pretty on their own. Remove these from your baking sheet and place them on your serving platter. I covered mine with Saran Wrap and put them in the fridge until it was dessert time. These are perfect for making in the morning and serving after dinner. Combine white chocolate and oil. Heat in microwave in 20-second increments, stirring after each, until melted. Dip one side of large marshmallow in chocolate, and scrape excess chocolate on the side of the bowl. 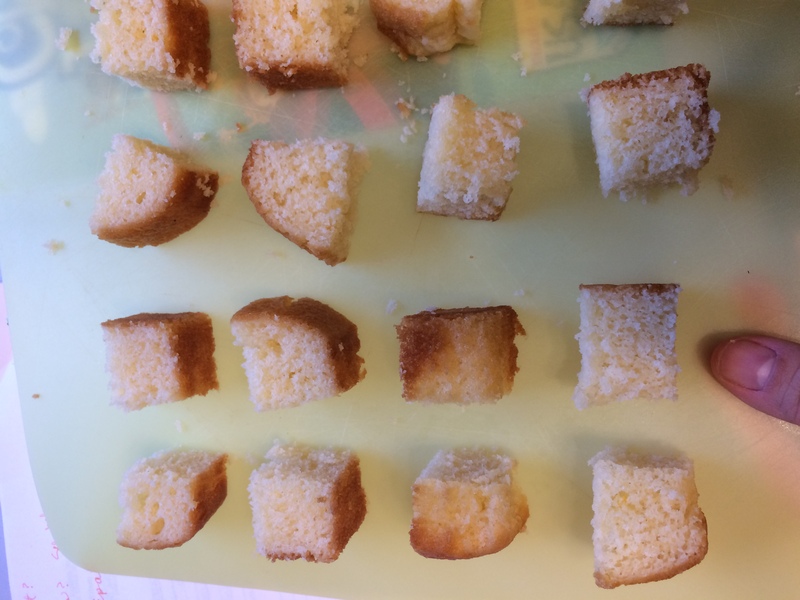 Cube pound cake. Wash and trim strawberries. Thread your skewers in whatever pattern suits you. 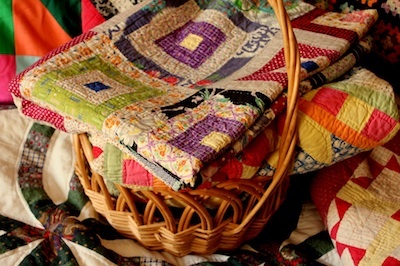 The recommended pattern- cake, strawberry, cake, marshmallow, cake, strawberry, cake. Place skewers on a baking sheet lined with wax paper. Use food coloring to color your remaining chocolate. Drizzle colored chocolate over the skewers in long horizontal pours. Remove from baking sheet and place on serving platter. Can be refrigerated for up to 10 hours. 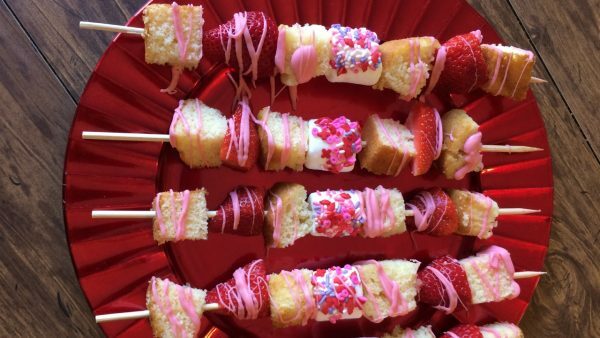 They look really good to have for a Valentine party or just at home with family. They do, don’t they, Juanita? So delicious.